MI-844 nicely elevates your TV, making it look like a wall mounted installation, without the hassle of drilling holes on the wall. 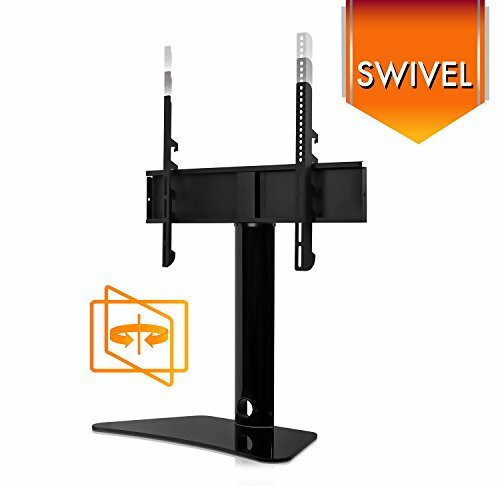 Swivel function allows you to turn the TV to left or right, without having to move the tv stand base. Wall mounted TVs look great but offer no storage for audio-video components, whereas classic entertainment centers do not allow the TVs to be installed high up over the shelves. MI-844 offers best of these two options by providing expansive shelf space and elevating your TV with its built-in TV mounting bracket. UNIVERSAL REPLACEMENT TV STAND. A great upgrade option with universal compatibility for 32, 37, 39, 40, 42, 47, 49, 50, 55 inch LCD LED Plasma flatscreen TVs. SWIVELING AND HEIGHT ADJUSTABLE. Designed to swivel 30 degrees to the left or right and it can be adjusted to 5 height positions to optimize the viewing level. ANTI-TIP BASE AND SAFETY CABLE. The 24" W x 11" D wide base is constructed of tempered saftey glass that can safely support up to 88 lbs. Pair it with the included safety cable for additional security! CABLE MANAGEMENT. Integrated cable pass-through port allows you to easily route A/V and power cables to the back of the stand. BRAND COMPATIBILITY. The TV bracket fits up to 600mm x 400mm VESA patterns for Samsung, Sony, LG, Sharp, Insignia, Vizio, Haier, Toshiba, Sharp, Element, and Westinghouse.